Primary Stat: Dexterity (DEX): The higher your DEX, the more damage you'll do when attacking. Some weapons require a certain amount of DEX before you can use them. After maxing your Dexterity stat, it is recommended you apply Ability Points (AP) to Strength (STR). This will increase your attack power less than Dexterity, but more than the other options. You can use the "Auto-Assign" function to allocate your Ability Points (AP) automatically. It will automatically put all of your AP in DEX, then when your DEX stat is maxed, it will put AP in STR. Angelic Buster will have her 1st job advancement complete when her tutorial ends. Check the light bulb notifier for her later job advancement quests: 2nd job at Lv.30, 3rd job at Lv.60, 4th job at Lv.100. From Lv.140-200, Angelic Buster will occasionally unlock special Hyper Skills. These passive and active skills will make her even more powerful. Angelic Buster must have a soul shooter equipped in order to use all of her skills. Angelic Buster can't obtain a unique mount or the Monster Rider ability, but she can move around quickly with his Feather Hop (double-jump) and Grappling Heart skills, and she can use general mount skills. Each Angelic Buster character has its own Cash Shop inventory, not shared with other characters. Descriptions: Inherit Eskalade's power to control both the Soul Shooter and Soul Ring. At Master Level: Weapon/Magic ATT +4%, Duration 40 minutes, Cooldown 2 hours. Master Level: 1. Obtained on Level 200. Descriptions: Draw out Eskalade's true strength to enhance your Soul Shooter's hidden power. At Master Level: Additional Soul Shooter Mastery +10%, Master Level: 1. Obtained on Level 200. Descriptions: Use your mastery of contract law to make Eskalade boost Attack Power for a short time. At Master Level: Damage +100%, Duration 10 sec, Cooldown 90 sec. Master Level: 1. Descriptions: Tosses a magical line above you to ascend to higher platforms. Press jump while moving to cancel. Master Level: 1. Descriptions: Move to Angelic Buster's room, The Lovely Buster Suite. Exits to Pantheon. Descriptions: Customize your post-transformation appearance. You can only change your appearance from the Coordinate equip window while transformed. Descriptions: Summon the power of Eskalade to transform into Angelic Buster. Descriptions: Fires a condensed stream of unrefined energy. Deals area damage when projectile hits. Soul Battery Skill: At Master Level: Damage 500%, Max Enemies Hit: 6, Recharge Chance: 70%. Master Level: 20. Descriptions: Tumble while jumping with direction key. Press jump again to repeat. Jumps further. Master Level: 10. Descriptions: Uses the power of Eskalade to see through enemy movements. At Master Level: Accuracy +450, Duration 180 sec. Master Level: 15. Descriptions: Get closer to Eskalade to draw out strength and make your body lighter. At Master Level: Permanently increases Recharge Rate by +20%, Speed by +20, Jump by 10 and Speed Limit by 10. Master Level: 20. Descriptions: Pierce enemies with a beam of pretty power and inflict a debuff. Use the skill again to detonate the debuff. 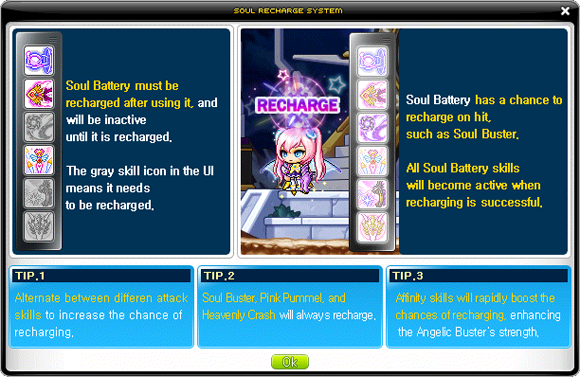 Soul Battery Skill: Inflict enemies with a debuff then use the skill again to detonate the debuff for massive damage. At Master Level: Damage 300%, Max Enemies Hit: 8, Recharge Chance: 50%. Master Level: 20. Descriptions: Generates a shield that absorbs a portion of damage dealt by the enemy. At Master Level: Damage 280%, Recharge Chance: 20%. Master Level: 20. Descriptions: Increase Soul Shooter Mastery, Accuracy, and Weapon Attack Power. At Master Level: Permanently increases Soul Shooter Mastery by +50%, Accuracy by +200 and Weapon ATT +20. Master Level: 10. At Master Level: Permanently increases DEX by +40. Master Level: 5. Descriptions: Get closer with Eskalade to receive battle experience and increase resistance. At Master Level: Every 10 enemies killed will give 100% chance for recharge. Permanently increases Status Ailment Resistance by +10% and All Elements Resistance by +10%. Master Level: 20. Descriptions: Extracts the essence of Eskalade's power and sends it flying at enemies. Deals damage continuously until it disappears. Soul Battery Skill: Create 4 essences that randomly attack 2 mobs within range: At Master Level: Damage 300%, Recreate Essence Chance: 60%, Recharge Chance: 40%, Max Damage: 10,000,000. Master Level: 20. Descriptions: Summons group of star blades enchanted with Eskalade's power. Soul Battery Skill: Damage dealt against enemies launched by Heavenly Crash doubled: At Master Level: Damage 480%, Max Enemies Hit: 8, Recharge Chance: 40%. Master Level: 20. Descriptions: Slams the ground to create a shockwave that attacks enemies in range and launches them. At Master Level: Damage +440%, Max Enemies Hit: 8, Recharge Chance: 20%. Master Level: 20. Descriptions: Endure Eskalade's advances to increase Weapon Attack. At Master Level: Damage +40, Duration 180 sec. Master Level: 20. Descriptions: Withstands enemy attacks with iron-like will. At Master Level: Power Stance chance 40%. Master Level: 20. Descriptions: Become more resistant to external damage with inner peace. At Master Level: Permanently increases Max HP by +1000 and Weapon/Magic DEF +1000. Master Level: 10. Descriptions: Get closer with Eskalade to increase DEX and acquire vision. At Master Level: 100% Recharge chance when Recharge fills 3 consecutive times. Permanently increases DEX by +20 and Damage by +10%. Master Level: 20. Descriptions: Sends out the soul-shaking roar of Eskalade. Soul Battery Skill: At Master Level: Damage 670%, Number of Attacks: 2, Max Monster Hit: 8, Stun Chance 60%, Stun Duration 6 sec, Recharge Chance: 50%, Max Damage: 30,000,000. Master Level: 30. Requires Mastery Book. Descriptions: Condenses Eskalade's power to attack one enemy continuously. Soul Battery Skill: Can deal up to 3 hits with additional input: Applies a stacking buff up to 4 times on hit: At Master Level: Damage 1060%, Number of Attacks: 1, Max Monster Hit: 1, Trinity Damage and DEF ignore buff: +10%, Recharge Chance: 40%, Max Damage: 40,000,000. Master Level: 30. Requires Mastery Book. Descriptions: Swings your ribbon with the power of love and justice to attack all nearby enemies. At Master Level: Damage 4000%, Number of Attacks: 1, Max Monster Hit: 10, Debuff Duration 30 sec, Attack Power -40%, Party Attack power -20%, Max Damage set to 1,200,000, Cooldown 90 sec, Recharge Chance: 80%, Max Damage: 99,999,999. Master Level: 30. Requires Mastery Book. Descriptions: Resonates with Eskalade's soul and brings him to life. At Master Level: Damage 500%, Max Monsters Hit: 10, Duration 8 sec, Max Finishing Blow Based on Remaining Duration: 2400%, Damage Against Bosses: +30%, Cooldown 60 sec, Max Damage: 99,999,999. Master Level: 30. Requires Mastery Book. Descriptions: Borrows Eskalade's power to receive eyes that see through enemies' soul. At Master Level: Max Critical Damage +60%, Minimum Critical Damage 30%, Doesn’t stack with Sharp Eyes. Master Level: 30. Requires Mastery Book. Descriptions: Increases Soul Shoot Mastery and Weapon Attack. At Master Level: Mastery +70%, Damage +30, Critical Rate +30%, Minimum Critical Damage +15%. Master Level: 30. Requires Mastery Book. Descriptions: Increases affinity with the ancient dragon race to obtain the pinnacle of Soul Recharge. At Master Level: 100% chance to reattempt Recharge again when it fails. 50% chance to increase damage by 25% for 5 seconds when Recharge is successful. Master Level: 30. Requires Mastery Book. At Master Level: All Stats +15%, Duration 900 sec. Master Level: 30. Requires Mastery Book. At Master Level: Cures all abnormal status: At Master Level: MP Cost: 30, Cooldown: 360 sec. Master Level: 5. Soul Seeker - Make Up: Increases Soul Seeker's recreation chance. Recreation chance +10%. Soul Seeker - Recharge Up: Increases Soul Seeker's recharge chance. Recharge chance +10%. Soul Seeker - Reinforce: Increases Soul Seeker's damage. Damage +20%. Finale Ribbon - Cooldown Cutter: Reduces Finale Ribbon cooldown. Cooldown: -20%. Finale Ribbon - Overwhelm: Increases Finale Ribbon's damage max value debuff amount. Debuff's damage max value +100000. Finale Ribbon - Reinforce: Increases Finale Ribbon's damage. Damage +20%. Soul Resonance - Persist: Increases Soul Resonance's duration. Duration +4 sec. Soul Resonance - Cooldown Cutter: Reduces Soul Resonance's cooldown. Cooldown -20%. Soul Resonance - Reinforce: Increases Soul Resonance's damage. Damage +20%. Final Contract: Duration: 30 seconds, Critical Rate +30%, Stance Chance +100%, Abormal Status Resistance +100%, Elemental Resistance +100%, Cooldown: 120 seconds. Supreme Supernova: Large supernova attack. Max Enemies Hit: 15, Duration: 12 seconds, Damage: 800%, Cooldown: 90 seconds, Max Damage: 9999999. Pretty Exaltation: Ignore inactive Recharge skills for 30 seconds, Cooldown: 90 seconds.